The plot is one of the four major pillars of a story. The plot is the evolvement of the story, the unfolding of the journey that your main protagonist(s) embark upon. 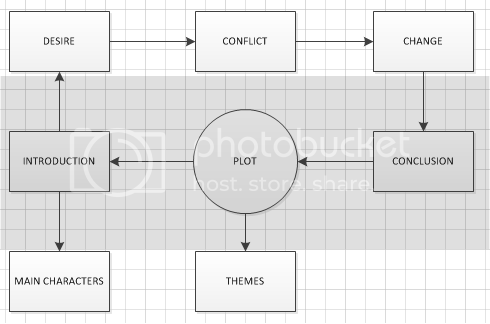 The question is, what makes a good plot? What aspects do you need to cover to ensure that your story is engaging and does not fall flat? Following on from yesterday, I am going to look into what makes a solid storyline for your novel. Writing a novel is similar to essay writing; all essays have an introduction, the body and a conclusion. What is different is that instead of providing examples within the main body of the story, you describe the journey that your characters make. Below is a visual representation. In your story, there will be at least one theme. What idea, message or moral are you trying to portray with your story? Will there be multiple themes? Having an underlying theme gives your story depth beyond the actions contained within the words. These themes can be subtle, extremely obvious or a mixture of both. These themes are what turns your story from two-dimensional to three-dimensional. There are twelve main themes in literature, see an example here. The introduction of a story is just that – an introduction. It is used to introduce your main characters and set the scene for the story. I have seen this tackled in two ways, either describing everything in minute detail, or revealing very little, leaving it up to the imagination of the reader to paint the picture within their own minds. My personal preference is to give little information to begin with, and then slowly build up the picture. This allows development of your characters and gives them a sense of depth; whenever you met someone new, do they immediately blurt out their entire life story, or do you get to know them over time? Within the introduction you should start to hint at what the story is to be about – what is reason for reading this story? The driving force behind the actions of the characters. In a way, you could say this is a theme, but it doesn’t have to be as deep as a theme. It could be lust, greed or a combination of any of the seven deadly sins. Or perhaps the desire could be less sinister. Once you have understood your characters desire, you can then explore the next section. Your character now understands what they want, but how do they obtain it? If it were easy, then it wouldn’t be very interesting now would it? There has to be a reason as to why they cannot acquire their desire. This is the conflict. Perhaps someone stands in the way of their goal, they may lack certain abilities, they may not have self-belief, they could be struggling to understand the situation…whatever their conflict is, describe it in detail. The conflict does not need to be literally thought of as a conflict, perhaps it is simply a realisation, gaining an understanding or travelling to a location. It is the reason why something must change to fulfil the desire. The change that the character goes through – either personally or experiences in the environment around them – is the path that they must travel to obtain their desire. This change will be difficult and it may require sacrifice. Whatever the change may be, the characters involved in the change will have gained (or lost) something that they didn’t/did have at the beginning of the story. Once this change has been acknowledged, the resolution to the desire can occur. The conclusion to the story. What was the outcome of the journey? Did the characters satisfy their desire? or was the conflict too large, the change too difficult? The resolution answers the questions raised at the beginning of the story, but it could also raise new questions or even leave some unanswered. The aim of the resolution is to allow the reader to feel as if a conclusion has been reached, even if this is not a permanent one. If the resolution is weak, then the reader could be left wondering – Is that it? or Huh? If someone reads your story and is thinking that at the end, something is missing within your story. What information is missing – is there a reason for the story? What is the challenge and how did the characters resolve it? What was the outcome? If these questions are then tied away in the resolution, the story should be complete.